Breaking News: Generous Challenge has been Met and Exceeded! We are thrilled to announce our matching donation campaign was more than successful, bringing in over $26,000 from either new donors or those who exceeded their 2015 gift! We are blown away and so very thankful. You can still give to help cover the costs as we move toward our mission goals for 2017. Donate now and help Come before Winter meet the challenge of renewing and equipping Christian leaders around the world. 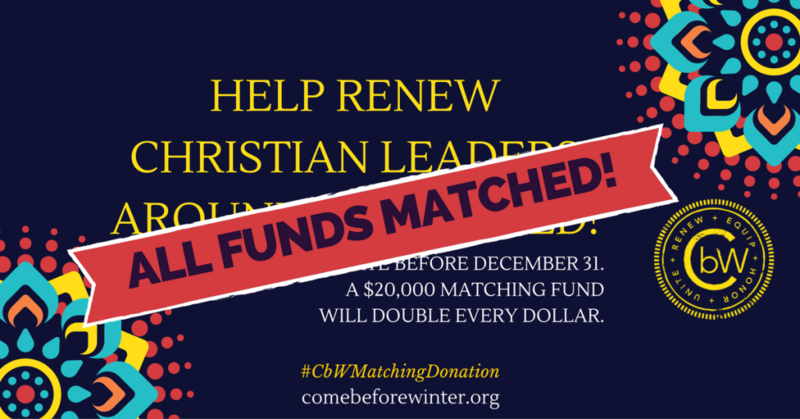 Earmark your donation to honor a specific CbW team member and help build the ministry as well. Being a minister can be a cold and isolating experience…even for the most seasoned worker. When that ministry occurs on foreign soil, the stress only multiplies. “Bring the cloak I left in Troas, and my scrolls, especially the parchment,” he urges. Today’s women in ministry can experience winter. Though Paul spoke of the physical season, winter can mean more than cold winds and dead leaves. The symbol can represent any period regarded as a time of decline, dreariness, or adversity.